Yesterday, I compared Cape Town weather with Kitsap weather and I think I’ll do a little more comparing today. Although I loved the coastal regions of South Africa where I served as a missionary, I wouldn’t recommend it to any storm chaser or weather fanatic. As my parents would tell me of all the great snow, wind or rain storms that would barrel into the west coast during the winter, I would cringe and try to not to think about the 110 degree weather I was experiencing outside. Of course, one thing I suppose I took for granted in South Africa is the steadiness of the weather patterns. You could easily forecast out seven days and have 6/7 days spot on. The “cape” of Africa is termed the “cape” of storms, but such storms are easier to predict and when they blow through, you have to wait no more than a few hours before the storm rolls away. Unfortunately, lately the weather models in our neck of the woods are shying away from a long range warm spell like it was teasing us with yesterday, but rest assured your Memorial Day weekend looks…dare I say it?…steady. I know many of your have been praying for a warm, dry weekend and, as long as you’re not too picky on what consitutues as warm, Friday and Saturday look remarkable! 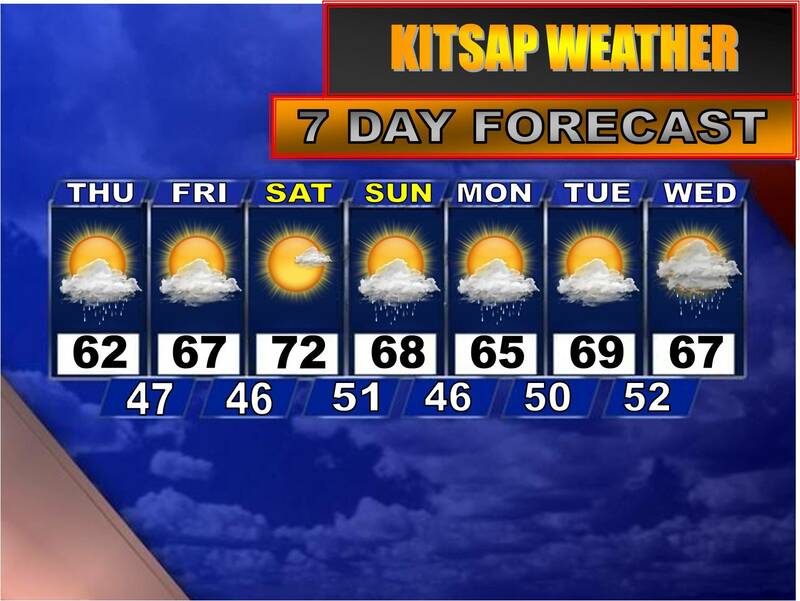 Highs both days will be near 70 with partly to mostly sunny skies. Thinking about mowing the lawn? These two days will be your best bet. Sunday through Wednesday looks rather seasonable, just not impressive when compared to this weekend. Highs will dip slightly to the mid and upper 60s, but the most dramatic difference will be the increase in cloud cover and increasing chance of rain, especially on Wednesday of next week. The longer range models are a bit disappointing to say the least. It appears we’ll be stuck in a rather cool and showery pattern for a while, which could mean a slighly delayed start to summer. Good to hear, and so glad to see you back blogging about Kitsap weather! Thanks Angela! It’s good to be back, as marvelous as my mission was. Hope you’re doing well!